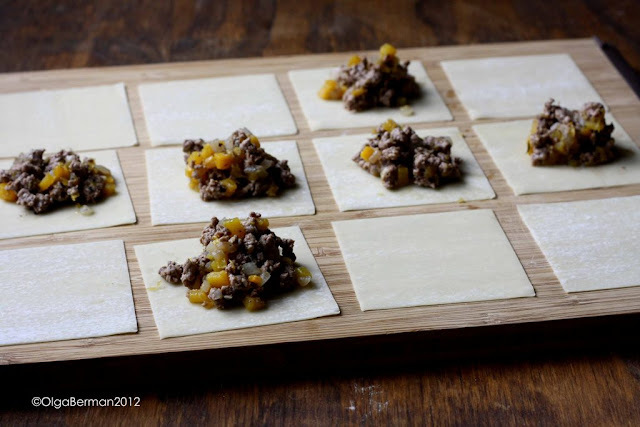 Mango & Tomato: What To Do With A Leg Of Lamb: Lamb & Butternut Squash Wonton Ravioli. What To Do With A Leg Of Lamb: Lamb & Butternut Squash Wonton Ravioli. Is this another lamb post? Yes, yes it is! This past March I visited Charleston and absolutely LOVED it. When I was invited to participate in the BB&T Charleston Wine and Food Lambs and Clams Original Recipe Contest for a chance to win tickets to the Charleston Wine & Food Festival, how could I say no? 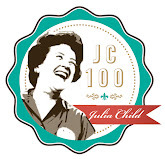 The recipe contest has four recipe challenges and your participation/voting is worth 25%!! 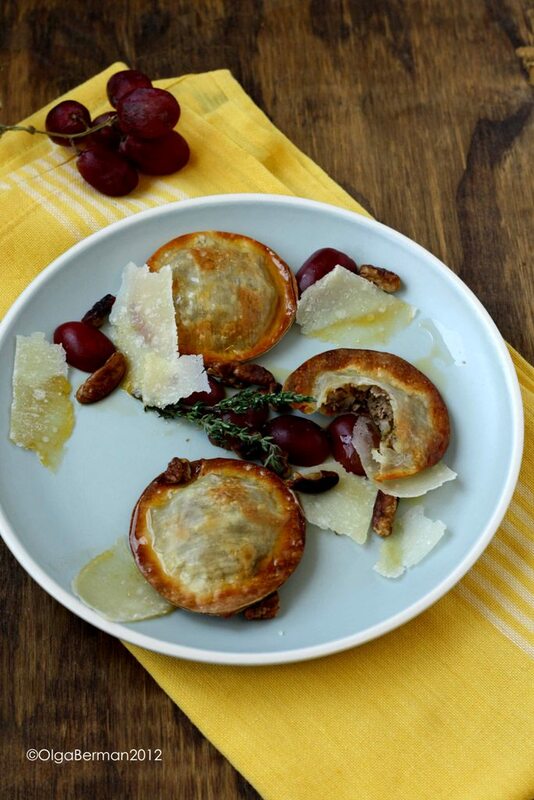 So please do vote if you like this recipe. 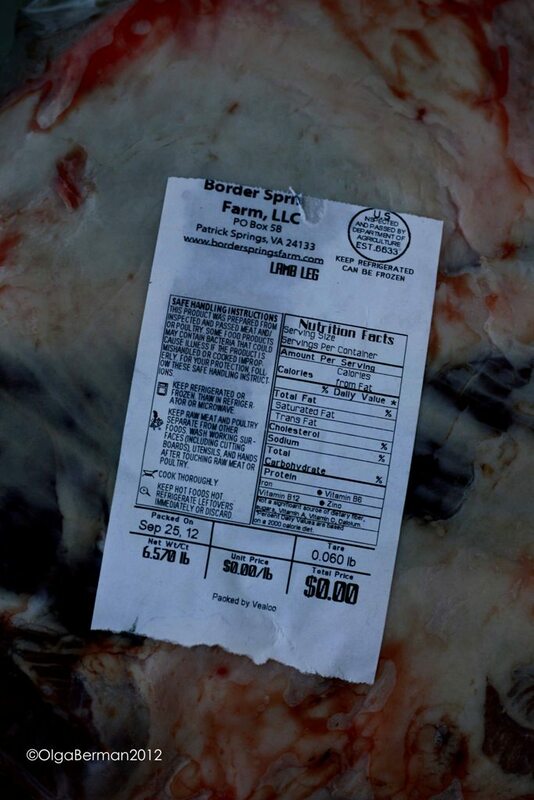 The first challenge is brought to you by Craig of Border Springs Farm: bone-in leg of lamb. 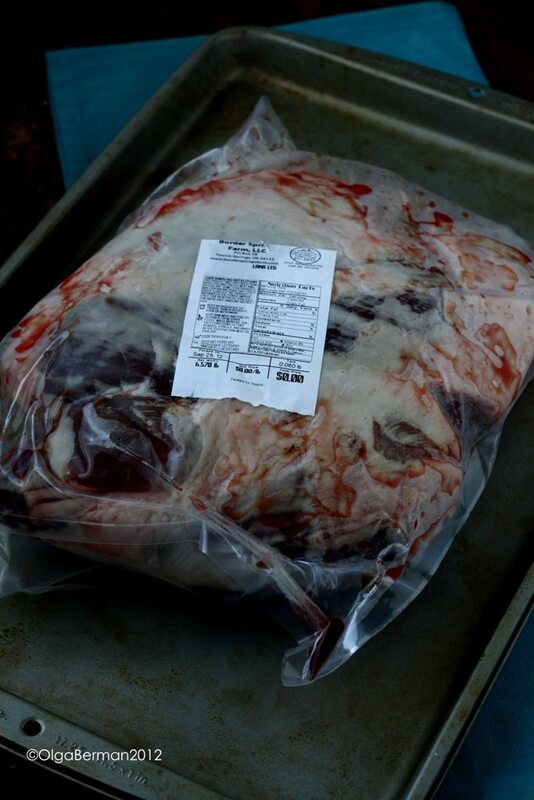 This is not the first time I've had the pleasure of working with the lamb from Craig's farm and I knew this would be quality product. I was correct. After going back and forth about what to make, I decided to grind the lamb in my mini food processor and make ravioli using wonton wrappers. 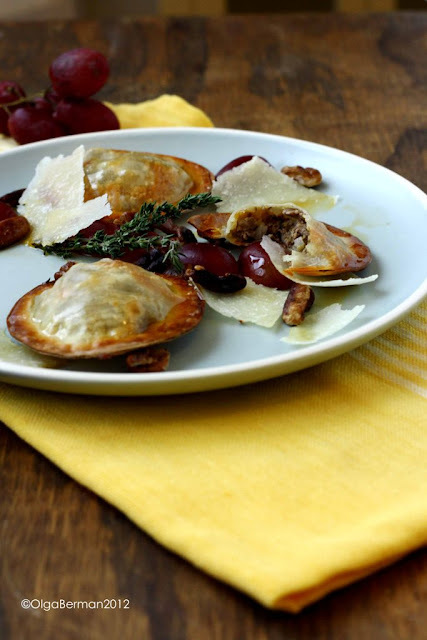 Special thank you to Sylvie for encouraging me to grind my lamb and to Anna for suggestions for how to bake these ravioli. Since it is finally getting cooler, I thought I'd have a fall feel to my dish. Since butternut squash screams fall to me and thyme goes well the the butternut squash, I decided to add those two ingredients to the ravioli filling. A few extra flavors, and my recipe was ready to be made! 2. Heat a large skillet. 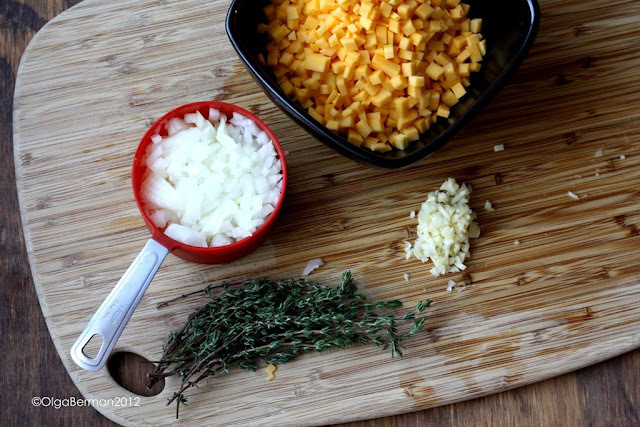 Add oil and allow it to heat. 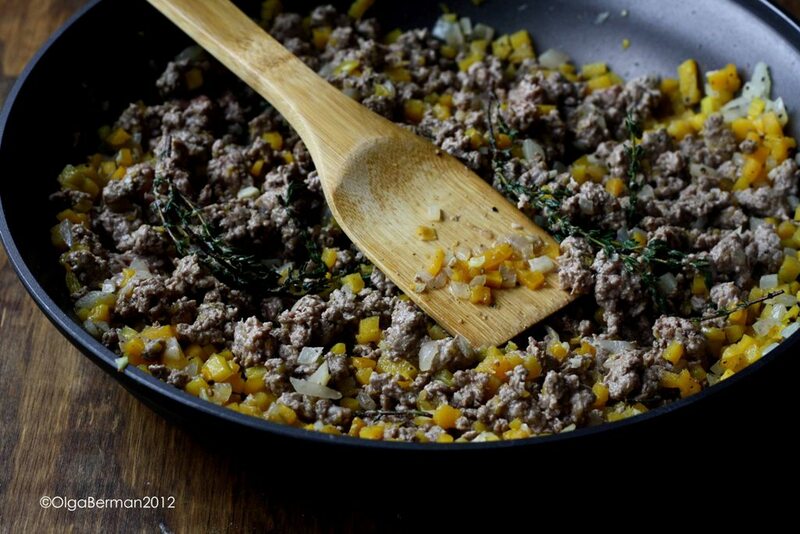 Add the onion, garlic and butternut squash and saute for 5 minutes. 3. 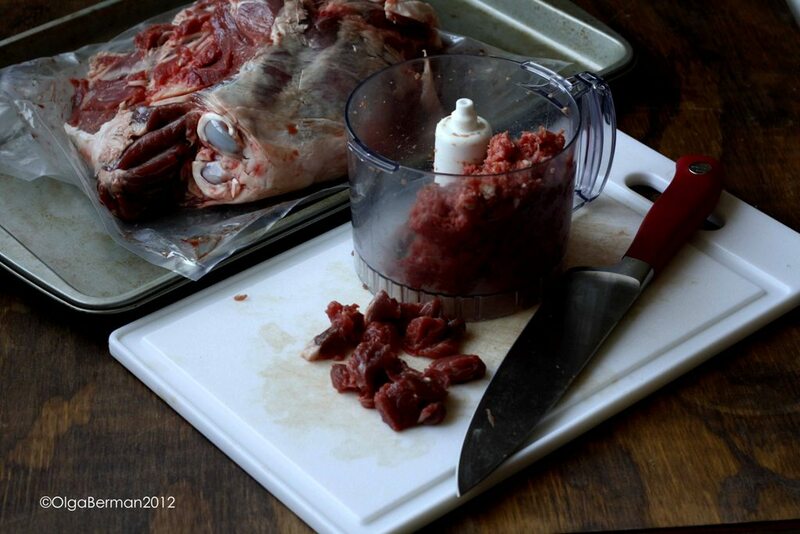 Add lamb, salt & pepper, thyme sprigs and saute until the lamb is no longer pink. 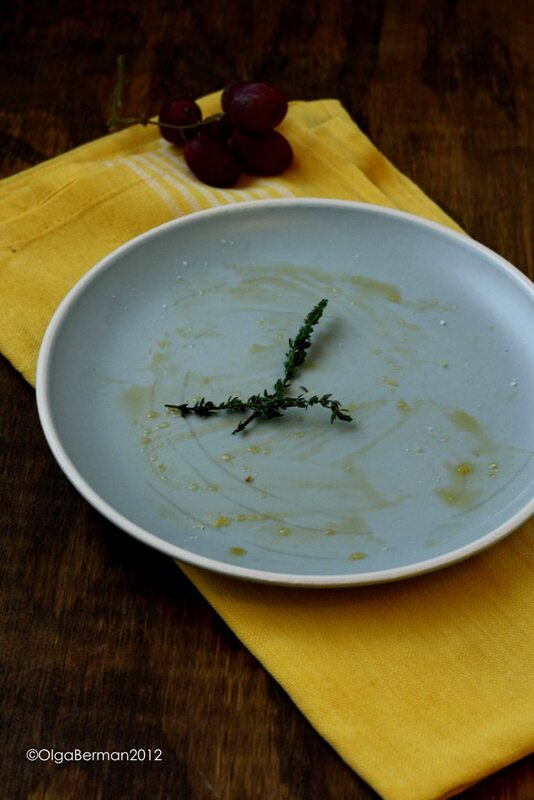 Remove the thyme sprigs. 5. 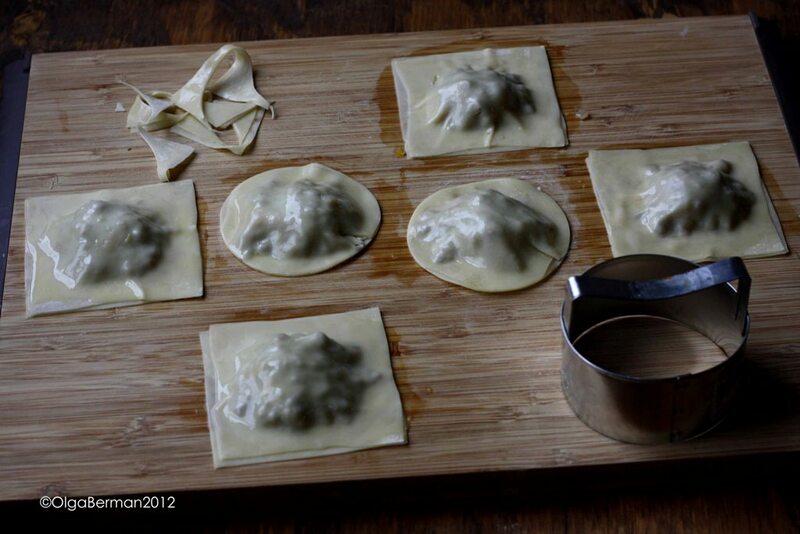 On a large surface lay out the wonton wrappers. 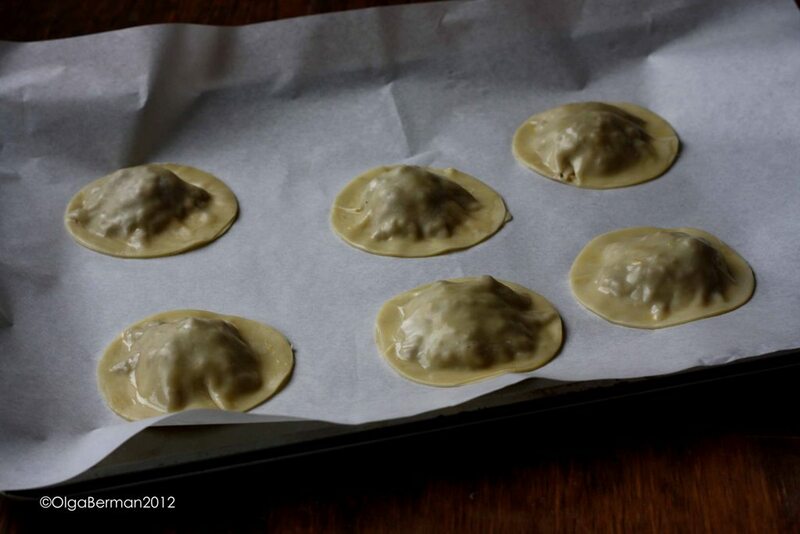 Top half of the wonton wrappers with the lamb/butternut squash mixture and brush the outside edges with the egg wash (egg+water). 6. Top the lamb mixture with the other half of the wonton wrappers squeezing out as much of the air as possible and making sure to seal the edges of the wrappers very well. 7. Using a biscuit cutter, transform the square wonton ravioli into round ones. 8. 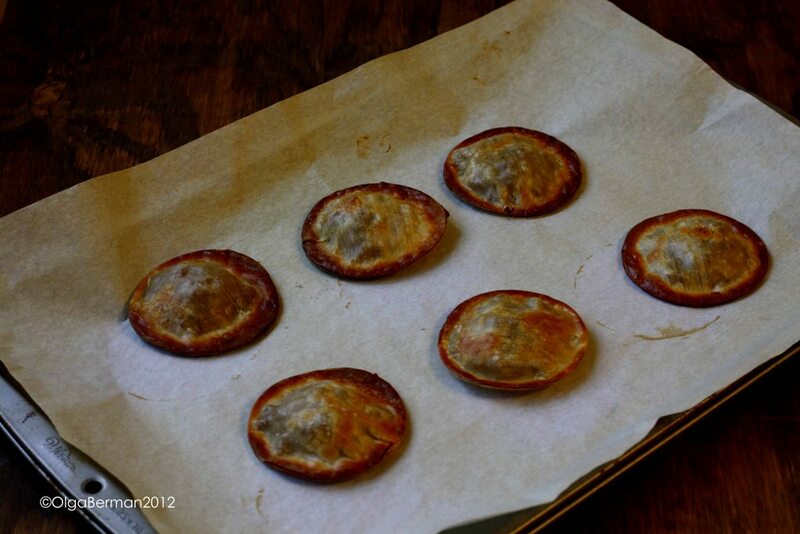 Brush the wonton ravioli with the egg wash and bake on a parchment paper topped cookie sheet for fifteen minutes. 9. 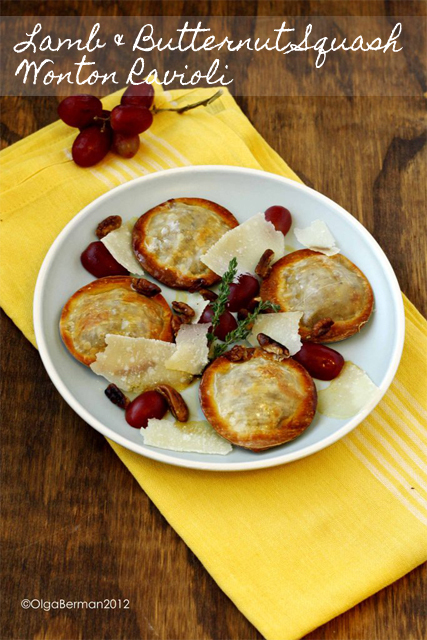 To serve, add the baked wonton ravioli to a plate, drizzle with the chili oil and top with shaved Parmesan, halved red grapes and toasted pecans. The baked wonton ravioli were incredibly crispy (in the best way possible) outside, while the inside was still tender and not dry. You can actually eat these with your hands: I did! 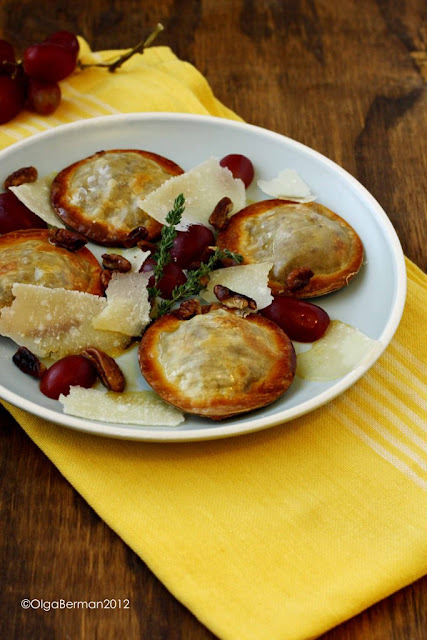 If you want to make this dish a bit simpler, skip the wonton wrappers and simply mix the lamb and butternut squash mixture with cooked pasta and then add chili oil, Parmesan cheese, grapes and pecans. Stay tuned for the other three challenges. They will involve more lamb, clams and oysters!!! 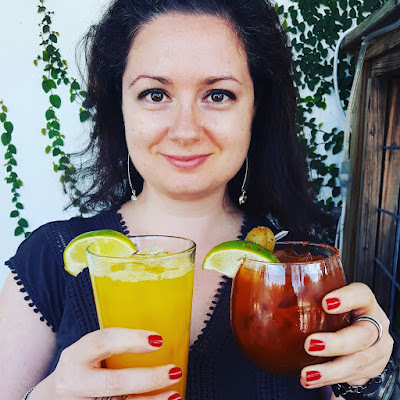 Yum Olga! I love the last shot. :) I almost made ravs too. I love that you baked them. Best of luck to you! Wonton wrappers are the best freakin thing ever!!! These are gorgeous!! What an amazing combination and the presentation is simply lovely. You need to win! These look amazing! I'm wowed! What a fabulous combo. Those are awesome! Love how crispy they got!